Aside from all that, we went off to do some walking on Madeira! We did consider Sicily, but after getting the Cicerone guide and finding that there’s little tradition of walking on the island we were going to have a hard time putting something together. Not impossible by any means, but more effort than we had time for. As it happens, the November TGO had a letter from someone recommending a company that probably would have helped us: www.alpineexploratory.com They will apparently do as much or as little route and accommodation planning as you like. But then a Portuguese friend of mine asked if we’d considered Madeira. In less than six hours we’d decided we liked the idea, and booked everything on Expedia! It was a odd feeling staying in one hotel for a week instead of moving from place to place, or camping. But we just wanted somewhere with warm weather in October, walker-friendly with as little up-front organisation required as possible. Madeira fitted the bill nicely. It was sort of a cross between our normal holiday and what most people would call a normal holiday. We even managed to fit in a swim in the sea. There were several inviting looking lido-like open air swimming pools, that all seemed to have access to the sea, that we would have tried had we more time. We seem to have timed it well as there weren’t too many people and the hotel was very cheap. Also the weather was kind for the season (according to the rainfall data) and we never felt a drop of rain all week. So here are a few notes about the place for anyone that fancies it as well as some pictures to whet your appetite. We bought the Cicerone guide by Paddy Dillon and “The Sunflower Guide”; Walking On Madeira. We found the Sunflower Guide to be far more accessible. There’s a picture from each walk next to the description and the style made it easy to quickly pick out walks that we liked the sound of. The maps in the Sunflower Guide are also relatively accurate and helpful. The Cicerone has a good introduction with some interesting history of the islands and the walks are well varied in terms of difficulty, with some crossover between the two books. If I had to choose one, it would be the Sunflower Guide but to be honest I’d prefer to have both since they each added something of their own. However neither of them was completely accurate but that’s less a fault of the books and more simply because the island has changed so rapidly. The change is generally good. One large and spectacular road to get you up and down the island and lots of little improvements to existing roads to improve things (and confuse the maps). The maps can be wildly out. The contours can be utterly wrong. For example, we knew we were on one side of a valley above a church but the map had us on the other side of a totally differently shaped valley. 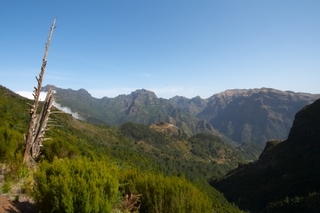 The Discovery Walking Guides’ Madeira Tour & Trail is very useful since it gives you a larger scale view of the island (available from themapshop.co.uk). The roads marked seem often to be only “indicative” and we found ourselves comparing the Tour & Trail map with the one in the back of the Sunflower Guide to get a slightly better picture of what was going on. But even then it was more to see where we might have been in retrospect. But since the island is only around fifty seven kilometres long you never go too badly wrong in a car, and it is all very pretty. On foot of course it can be pretty tricky and even consulting the GPS doesn’t always help since the maps are just so wrong. Paddy Dillon recommends the Cadastral maps but they’re out of print and I could find no stock anywhere. However we eventually found them framed on the wall of the hotel. They were dated 1993 and since they’re now out of print I suppose they were the latest version. Luckily they simply weren’t as good as the Discovery Walking Guides map. Probably easier than driving on the Isle of Mull in some ways. Other drivers were very courteous. Coming from the UK you need to do the usual mental swap-sides all the time (I find it easier to try to think about protecting the passenger by keeping them on the kerb whilst I sit out towards the middle of the road – whatever works!). We never saw a road number sign, despite the map mentioning them, but the Sunflower guide says they’re planning to get around to adding them. The actual walking can be quite varied. I won’t repeat too much of what is mentioned on many web sites about the network of irrigation channels called “levadas” that provide easy and sometimes quite exposed but spectacular walking. Without them much of the island would be completely inaccessible as they cut through jungle, cliff-side and even tunnel straight through the mountains (bring a torch!). We carried Aqua Mira so that we could drink from the levadas if we needed to but in the end we never ran out of water. We also found there was good and even quite strenuous walking around the higher peaks like Pico Ruivo. A fourteen kilometre day with 750 meters in height in that heat and humidity is quite demanding at times. Bring a sun hat. Preferably a Tilley of course. Overall though the walking was not particularly demanding and there’s something that anyone at all can do. The levadas especially, since they generally run at a very shallow incline. The highest mountain on the island is Pico Ruivo “Ginger Peak”. Perhaps appropriate for the “Red” Yeti – but it actually refers to the plant rather than the colour. There is a refuge near the summit and the Cicerone simply mentions it as providing “a bed for the night”. The Sunflower however advises to book via the Funchal tourist office. We asked there and were directed down the street to the government office that handles bookings. They were very helpful but it seems that it’s a very popular place to stay and is almost always solidly booked out with locals all the year round. Reservations are only made for the current calendar year so it’s not possible to book one summer for the next. They gave us an email address: balcaoverde.sra@gov-madeira.pt that it might be worth trying if you really want to get in there – but don’t hold your breath! It can be very wet, even though its always warm, so bring your waterproofs. It’s also worth remembering that the central highlands are sometimes poking above a beautiful cloud layer (see the picture at the top of this posting) or of course they may be clagged in completely! One of the most striking things was how friendly the Madeiran people were. On more than one occasion people called us over and asked us where we were going and then gave us directions. Once someone even pulled up in his car to just to give us directions for a tricky path turning he thought, rightly, that we might be looking for a couple of kilometres ahead. Overall it’s a lovely place to walk or just relax. Might be a perfect place for a “compromise” holiday if someone you go with isn’t into their walking! A very nice impression of Madeira and the levada walks. Alos love the pictures you have taken. Beautiful. Thanks for sharing this with us. Thanks Don! Glad to have found your Blog as well – very interesting if you like Madeira. That site you found where Nick Hubbard has scanned in his aunt’s diary from a visit in 1954 is amazing. Its like a Blog from 1954. I met a fascinating man on the plane back. He was born in Funchal in 1920 and worked in the hotel trade when the only planes were sea planes. He worked on Madeira for six months of the year and on Jersey for the other six. Eventually he tired of the constant switching places and moved to Jersey full time. He only comes back for surprise visits to his relatives in Funchal every few years and I was lucky enough to catch him. Blog from 1954 …. yes that is a good title for it. I have changed it immediately … obrigado! Aahhh … the sea planes …. now that is one attraction I really wished would come back to the island. If any rich man (or woman) is thinking to do this … please let me know. I would be one of the first passengers.